#FakeNews over a dead body. A B&W photo is a viral on social media with Rahul and Rajiv Gandhi in it among a crowd. It’s claimed that they read Kalmaa at funeral of Indira Gandhi. Ex PM PV Narsimha Rao also is present in the photo with folded hands. 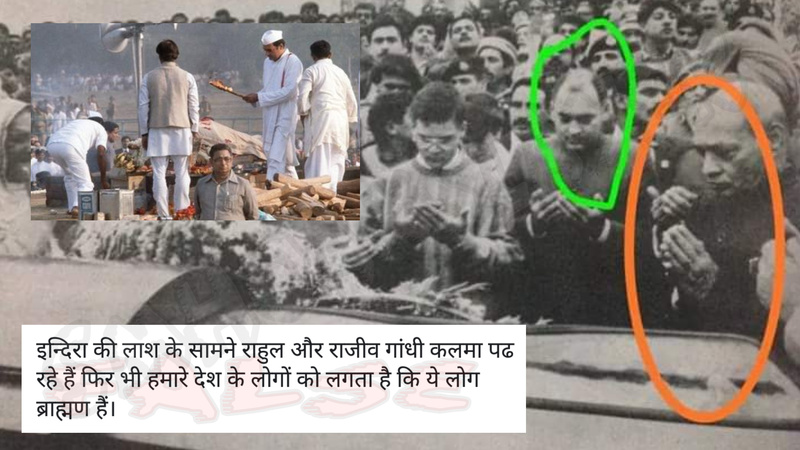 Both Ex PM, Mr. Rajiv and MR. Rao are circled in the photo. Rajiv Gandhi along with family went to Peshawar to pay last respects to Bacha Khan’s funeral. ← Did 5G tests kill 297 birds in Netherlands? ABP News didn’t say Congress is winning Gujarat, Photoshop did ! September 7, 2018 Hoax Slayer Comments Off on This is not the first fake image tweeted by Sanjay Nirupam.